The in-flight failure of a critical support strut inside the second stage liquid oxygen tank holding a high pressure helium tank in the Falcon 9 rocket, is the likely cause of the failed SpaceX launch three weeks ago on June 28, revealed SpaceX CEO and chief designer Elon Musk during a briefing for reporters held today, July 20, to explain why the critical cargo delivery run for NASA to the space station suddenly turned into a total disaster after a promising start. The commercial booster and its cargo Dragon payload were unexpectedly destroyed by an overpressure event 139 seconds after a picture perfect blastoff from Space Launch Complex 40 at Cape Canaveral Air Force Station in Florida on June 28 at 10:21 a.m. EDT. Musk emphasized that the failure analysis is still “preliminary” and an “initial assessment” based on the investigation thus far. SpaceX has led the investigation efforts under the oversight of the FAA with participation from prime customers NASA and the U.S. Air Force. The root cause appears to be that the second stage strut holding the high pressure helium tank inside the 2nd stage broke at a bolt – far below its design specification and thereby allowing the tank to break free and swing away. “The strut that we believe failed was designed and certified to handle 10,000 lbs of force, but failed at 2,000 lbs, a five-fold difference,” Musk explained. To date no other issues have been identified as possible failure modes, Musk elaborated. The helium tanks are pressurized to 5500 psi and were breached during the over pressurization. The purpose of the helium tanks is to pressurize the first and second stage propellant tanks. “Detailed close-out photos of stage construction show no visible flaws or damage of any kind,” according to a SpaceX statement. The struts are produced by an outside vendor that Musk would not identify. He added that in the future, SpaceX will likely choose a different vendor to manufacture the struts. He said the struts were made from a type of stainless steel and would also likely be redesigned. “The material of construction will be changed to Inconel,” Musk told me in response to a question. Hundreds of the original type struts have been used to date on the first and second stages of the Falcon 9 with no issues. In the future, they will also be independently certified for use, by an outside contractor instead of the vendor. The nine first stage Merlin 1D engines of the Falcon 9 were still firing nominally during the start of the mishap, said Musk. The first stage had nearly completed its planned firing duration when the explosion took place. “The event happened very quickly, within 0.893 seconds,” Musk stated, from the first indication of an issue to loss of all telemetry. “Preliminary analysis suggests the overpressure event in the upper stage liquid oxygen tank was initiated by a flawed piece of support hardware (a “strut”) inside the second stage,” noted SpaceX in a statement. The blastoff of the Dragon CRS-7 cargo mission for NASA was the first failure of the SpaceX Falcon 9 rocket after 18 straight successes and the firms first launch mishap since the failure of a Falcon 1 in 2008. The Dragon cargo freighter survived the explosion but was destroyed when it impacted the Atlantic Ocean. “But the Dragon might have been saved if the parachutes had been deployed,” said Musk. Unfortunately the software required to deploy the parachute was not loaded onboard. “The new software required to deploy the parachutes will be included on all future Dragons, V1 and V2,” said Musk, referring to the cargo and crew versions of the SpaceX Dragon spaceship. The NASA cargo was valued at about $110 million. The launch itself was not insured. The investigation board is reviewing data from over 3,000 telemetry channels as well as video and physical debris, he noted. The next launch of a Falcon 9 will be postponed at least a few months until “no earlier than September” Musk indicated. Two Falcon 9 launches had been set for August from Vandenberg AFB and Cape Canaveral. And the next launch to the ISS had been slated for September on the Dragon CRS-8 mission. Musk said the next payload to be launched aboard a Falcon 9 has yet to be determined. Starting in 2017, the Falcon 9 will launch astronauts to the ISS aboard the Crew Dragon. Overall CRS-7 was the seventh SpaceX commercial resupply services mission and the eighth trip by a Dragon spacecraft to the station since 2012. CRS-7 marked the company’s seventh operational resupply mission to the ISS under a $1.6 Billion contract with NASA to deliver 20,000 kg (44,000 pounds) of cargo to the station during a dozen Dragon cargo spacecraft flights through 2016 under NASA’s original Commercial Resupply Services (CRS) contract. KENNEDY SPACE CENTER, FL – SpaceX and NASA are diligently working to “identify the root cause” of the June 28 in flight failure of the firms Falcon 9 rocket, as the accident investigation team focuses on “flight data” rather than recovered debris as the best avenue for determining exactly what went wrong, a SpaceX spokesperson told Universe Today. The SpaceX Falcon 9 booster broke up just minutes after a picture perfect blastoff from a seaside Florida launch pad on a critical mission for NASA bound for the International Space Station (ISS). It was carrying a SpaceX Dragon cargo freighter loaded with research equipment and new hardware to enable crewed spaceships to dock at the orbiting outpost. The accident investigation team is still seeking the root cause of the launch failure through a complex fault tree analysis. “The process for determining the root cause of Sunday’s mishap is complex, and there is no one theory yet that is consistent with the data,” said SpaceX spokesman John Taylor. The SpaceX CRS-7 cargo resupply mission to the ISS began flawlessly. The nine Merlin 1D engines powering the Falcon 9 rockets first stage were firing nominally at launch to produce about 1.3 million pounds of liftoff thrust for almost their entire duration. However, approximately 139 seconds into the planned 159 second firing of the first stage engine, the majestic blastoff went awry as the upper stage of the vehicle experienced an as yet unexplained anomaly and suddenly exploded, vaporizing into a grayish cloud at supersonic speed and raining debris down into the Atlantic Ocean. The Falcon 9 has transmitting data on over 3,000 channels of flight data streams. But something went wrong apparently with the upper stage said SpaceX CEO Elon Musk. But why that happened and the vehicle disintegrated in mere seconds is still a mystery to be resolved through careful fault tree analysis of the data. While SpaceX and Coast Guard ships have recovered some debris in the days since the launch mishap, the data streams are expected to be the most useful source of information to the investigation team. Hex editors are being used to comb through the data. The name ‘hex’ comes from ‘hexadecimal’: a standard numerical format for representing binary data. Some data was transmitted after the breakup. The accident investigation teams are currently in the process of recreating the final milliseconds of the flight to give them some additional insights into what may have happened, when and why. The next SpaceX cargo Dragon had been scheduled for liftoff in September 2015 on the CRS-8 mission, but is now postponed pending the results of the return to flight investigation. There are sufficient supplies on board the ISS to keep the crew continuing their mission until at least October 2015. These included critical materials for the science and research investigations for the first ever one-year crew to serve aboard the ISS – comprising Scott Kelly and Mikhail Kornienko. Another Russian Progress vehicle is set to fly on the next resupply mission from the Baikonur Cosmodrome on Friday, July 3. KENNEDY SPACE CENTER, FL – With launch less than a day away for SpaceX’s seventh commercial resupply mission carrying a two ton payload of critical science and cargo for the future buildup of human spaceflight to the International Space Station (ISS) on Sunday, June 28, “everything is looking great” and all systems are GO, Hans Koenigsmann, SpaceX VP of mission assurance announced at a media briefing for reporters at the Kennedy Space Center. The weather outlook along the Florida Space Coast is fantastic as U.S. Air Force 45th Weather Squadron forecasters are predicting a 90 percent chance of favorable conditions for lift off of the SpaceX Falcon 9 rocket and Dragon spacecraft, slated for 10:21 a.m. EDT, Sunday, June 28, from Space Launch Complex 40 at Cape Canaveral Air Force Station in Florida. The Falcon 9 first stage is outfitted with four landing legs and grid fins to enable the landing attempt, which is a secondary objective of SpaceX. Cargo delivery to the station is the overriding primary objective and the entire reason for the CRS-7 mission. If you are free this weekend and all continues to go well, this could well be your chance to be an eyewitness to a magnificent space launch in sunny Florida – and see a flight that signifies significant progress towards restoring America’s ability to once again launch our astronauts on American rockets from American soil. The mission is critical for NASA in more ways than one, in addition to the science cargo, the SpaceX Dragon spaceship is loaded with the first of two International Docking Adapters (IDA’s), pictured below, that will be connected to the space station to provide a place for Commercial Crew spacecraft carrying astronauts to dock to the orbiting laboratory as soon as 2017. The approximately 30 inch thick and ring shaped IDA is loaded in the unpressurized truck section at the rear of the Dragon. The pressurized section of the Dragon is packed with over 4,000 pounds of research experiments, spare parts, gear, high pressure supply gases, food, water and clothing for the astronaut and cosmonaut crews comprising Expeditions 44 and 45. 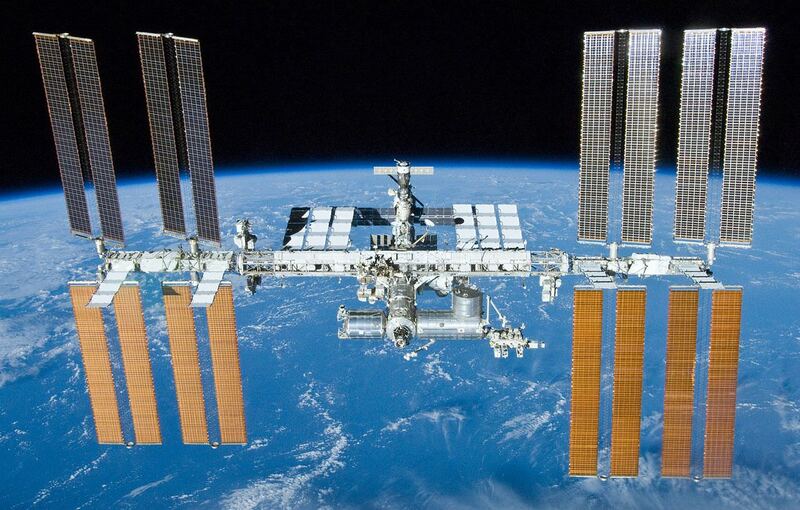 These include critical materials for the science and research investigations for the first ever one-year crew to serve aboard the ISS – comprising NASA astronaut Scott Kelly and Russian cosmonaut Mikhail Kornienko. The science payloads will offer new insight to combustion in microgravity, perform the first space-based observations of meteors entering Earth’s atmosphere, continue solving potential crew health risks and make new strides toward being able to grow food in space, says NASA. Some three dozen student science experiments are also flying aboard. The cargo also includes the METEOR camera. Both IDA’s were built by Boeing. They will enable docking by the new space taxis being built by Boeing and Space X – the CST-100 and crew Dragon respectively, to carry our crews to the ISS and end our sole source reliance on the Russian Soyuz capsule. IDA 1 will be attached to the forward port on the Harmony node, where the space shuttles used to dock. If Dragon launches on Sunday as planned, it will reach the space station after a two day pursuit on Tuesday, June 30. NASA’s Scott Kelly of NASA will use the station’s Canadarm2 robotic arm to reach out and capture Dragon at about 7 a.m. He will be assisted by Station commander Gennady Padalka of the Russian Federal Space Agency (Roscosmos) as they operate the 57 foot long arm from the station’s cupola. NASA TV coverage of rendezvous and grapple of Dragon will begin at 5:30 a.m. on Tuesday. Coverage of Dragon’s installation to the Earth-facing port of the Harmony module will begin at 8:30 a.m.